Pictured, Courtney Whithorn who was forced to have her thumb amputated. Psychology student, Courtney Whithorn is forced to have her thumb amputated after developing rare skin cancer from years of biting her nails after constant bullying. A student who developed a rare form of skin cancer after constantly biting her nails following constant bullying has had to have her thumb amputated. Courtney Whithorn, now 20, started what she described as a ‘nervous habit’ after being bullied at school, which led to her biting her thumb nail clean off in 2014. 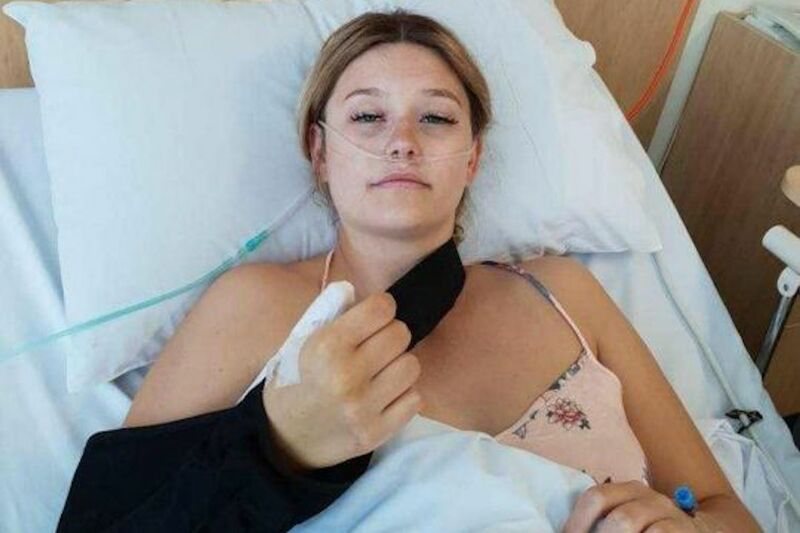 Despite ‘freaking out’ when her thumb started to turn black, the embarrassed, then teen, kept it hidden from her family and friends by keeping her hands in a fist and wearing fake nails for four years. Whithorn’s attempts to keep her deteriorating condition a secret led the psychology student had causing havoc to her nail bed that it developed into a rare cancer type named acral lentiginous subungual melanoma. The development according to the girl originally hailing from the UK‘s Newton Aycliffe, Co Durham, who moved to The Gold Coast, Australia, nine years ago left her ‘shattered’. Explained Whithorn via Mercury Press and Media, ‘When I found out that biting my nail off was the cause of the cancer it shattered me. Courtney Whithorn receives ‘shocking’ diagnosis. Since her diagnosis in July, Courtney has had to have four surgeries. Despite attempts to save her thumb, Courtney’s fourth surgery which took place last week saw it completely removed. She went to a doctor for cosmetic reasons and was referred to a plastic surgeon who suggested removing the nail bed to get rid of the black. But before the first surgery, the doctor could tell something was wrong and did a biopsy. After Courtney’s second surgery to remove her nail bed, she had a PET scan to produce a detailed 3D image of the inside of her thumb and no more cancerous cells were found. But panic arose when just a week after thinking she had the all clear, specialists in Sydney told Courtney’s surgeon that the protocol for her form of melanoma is amputation. The surgeon decided to first perform a third surgery, creating a wider incision in Courtney’s thumb to remove any more malignant cells – but that operation only confirmed the need to amputate from above the knuckle. Pictured, Courtney Whithorn. Image via Facebook. The experience has led to the student having to defer her studies at Griffiths University to recover. Courtney is still waiting for the results from her surgery and the surgeon will keep an eye on it for the next five years with regular scans. According to Courtney, her condition stems from her resorting to biting her nails, when at the age of 16 she became the victim of school bulling – and reckoning with stress and anxiety. After her classmate Tyson Donnelly, now 20, stuck up for her during the intense bullying, he and Courtney became more than just friends – and have been dating for four years.